The advocacy of the Regional Coalition of LANL Communities has achieve a multitude of change through our regional communities. Our collective voice has increased LANL cleanup budgets by tens of millions of dollars, ensured ongoing support for community commitment contributions by future LANL prime contractors, led effort to pass a Bill to save the State of NM and local communities $176 million in annual GRT revenues, and protected the interest of local contractors to compete on contracts at LANL. The Regional Coalition of LANL Communities has started 2019 by advocating for NM Senate Bill 11, an effort to ensure that the prime contractors of DOE facilities and state-funded laboratories in New Mexico continue to pay their fair share through GRT to our local communities and state government. SB 11 was passed by the legislature and on February 28, Governor Michell Lujan Grisham signed the bill into law. You can see press statements from the Governor and copies of the bill and amendments HERE. In May 2018 the Department of Energy (DOE) promulgated new rule 140.1, restricting the ability of the Defense Nuclear Facilities Safety Board (DNFSB) to access certain nuclear-related sites or to access information related to activities at certain cites. The DNFSB, a congressionally created oversight body charged with helping to keep DOE practices safe has no say on whether these new rules stand, but thanks to efforts by New Mexico Senators Udall and Heinrich the DNFSB has held a series of three public hearings to discuss the rule change and provide both DOE and DNFSB with community input into the change. The DNFSB traveled to Albuquerque on February 22, 2019, and held a public hearing at the Albuquerque Convention Center. The RCLC was present to express concerns, and a formal statement on the issue was later adopted. Click HERE to read the RCLC statement on the DNFSB rule 140.1. NM Legislative bill passed in support of preservation of ~$162 million in GRT revenue to state and local communities. Efforts began in May 2016 to ensure our communities would not lose critical revenues that provide critical programs and resources for host communities to LANL employees. An acquisition to find the next manager and operator began in June 2017, and the RCLC took reigns of ensuring our communities had pathways of engagement with potential management and operations contractors at LANL. Our efforts to engage in NNSA acquisition has been to protect our interests in continuing $3+ million in Community Commitment Investments that serves education, economic development and community charitable organizations; protect local contractors in order to maintain a 5% preference on contracts at LANL; to ensure our Communities are considered and acted upon as the first customer to Lab activities, and much more. 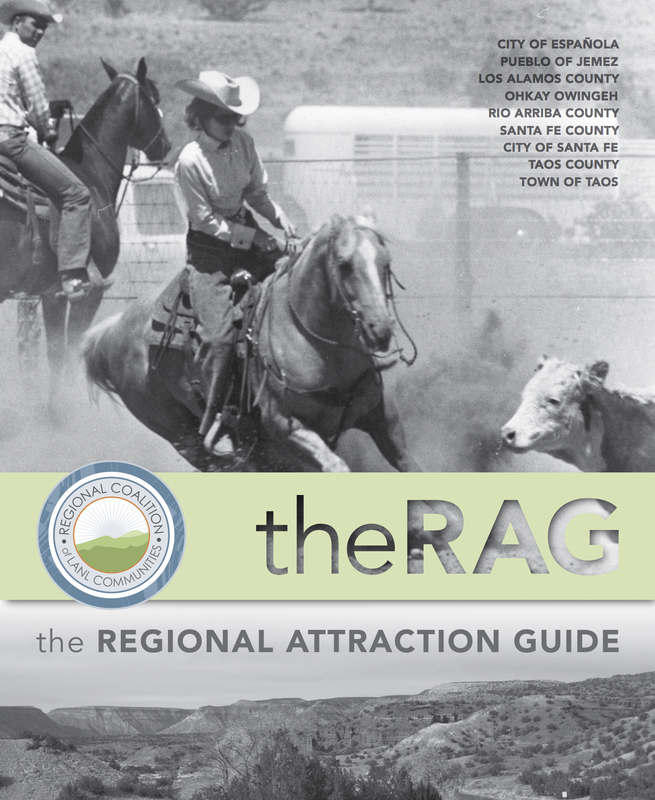 The RCLC produced a first-of-its-kind ‘Regional Attraction Guide’ or RAG Magazine to provide key insights to those seeking to live and thrive around Los Alamos National Laboratory, and introduce them to our communities. Over 60% of LANL employees live outside of Los Alamos County, and require key information to get engaged in surrounding communities. The RCLC was the sole voice from NM to request that the Defense Nuclear Facilities Safety Board remain in tact as a necessary oversight component of nuclear facility safety, security and maintenance, when threats to dissolve the organization were discovered.